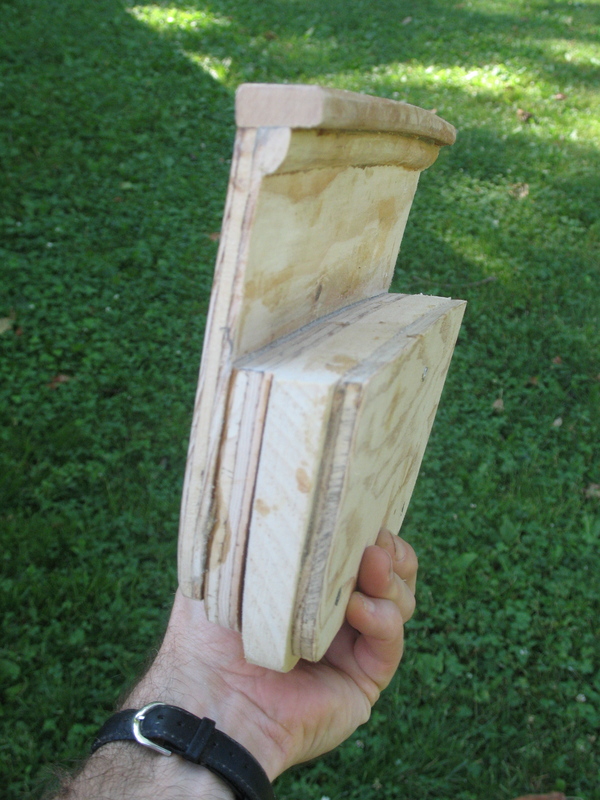 This entry was posted on Monday, June 7th, 2010 at 7:21 am and is filed under Building the Cabin and Seats. You can follow any responses to this entry through the RSS 2.0 feed. You can leave a response, or trackback from your own site. 7 Responses to Horsepower or Human Power? I had small outboards 2 hp and 5 hp and yes, gas, smelling, noisy and only somewhat reliable. I used a 50 lbs thrust electric trolling motor on a compac-16 and a MFG 19 (old heavy fiberglass sailboat) in lake enviornment – loved it. Batteries are heavy but you turn it on and it goes – forward and backward. 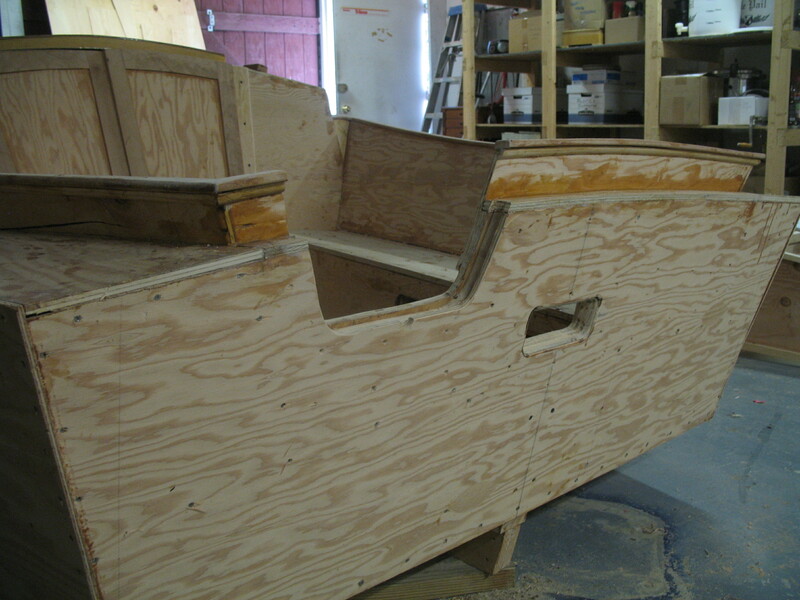 Boat is looking great – each step is one step closer to launch. Great to hear from you, Tom! I really appreciate the endorsement of the trawling motor. If you think I’m ignorant about boat building, you won’t believe all the things I don’t know about motors. I am *so* ready to get in the water. 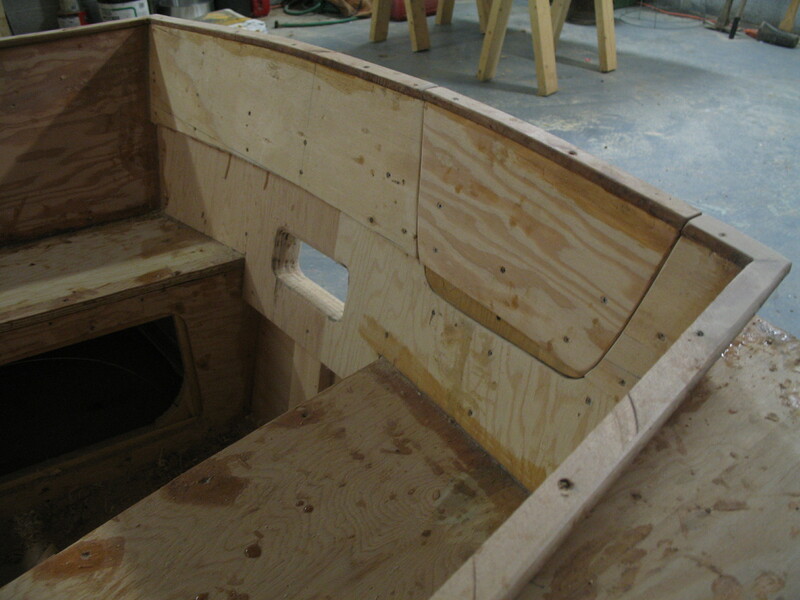 Just today I started the process of filling and sanding the hull in preparation for fiberglassing. IMHO, if you put any motor at all on this lovely little boat you will rob yourself 80% of the pleasure of being a “Sailor”. Sure there are plenty of good reasons to have a motor but it will not change the fact it will make you less of a sailor. The motor mount pieces for my Passagemaker are lost in my mother-in-laws garage and I’ve been very happy with that choice. Your comments brought Lin and Larry Pardey to mind immeadiately. I’m rusty on my facts but I think it was after their first circumnavigation in the 70s that their boat was moored at Newport Beach, CA for a while. I was doing a lot of sailing in the bay in those days and I would always sail aver to their boat to admire it. Larry had built it and it was 27 feet long as I recall. And it had no motor. They would skull when necessary. They gave a lecture at a near-by college which Jeff and i atended. We went up and shook hands with them after the program. Listening to their story and meeting them was a real inspiration. They have remained active in cruising and have circumnavigated both east and west around. They have written a number of very interesting and useful books. Their advice to would-be sailors is Go Simple, Go Small, Go Now. I think they are now living in New Zealand. What a great story. Thanks for the support and inspiration. I’ll be in the water soon! Wonderful site. Loads of productive information here. I’m sending it to some friends!